Nine years of a National Party Government pandering to separatist demands will be an issue that voters will consider in next year’s general election, Auckland business manager Casey Costello said today. Ms Costello who, with former National Party leader Don Brash, represents a new national campaign named Hobson’s Pledge, launched today, [28 Sep 2016] said that successive Governments have taken New Zealand further and further away from the kind of country that most New Zealanders want – one where everybody is equal before the law. Ms Costello, who says she feels driven to step forward for both her Ngapuhi and Anglo-Irish ancestors, made it clear that New Zealand was doomed to increasing racial resentment if we continued on our present track. Hobson’s Pledge Trust has been established to oppose moves at central or local government level which would lock in constitutional preferences for anybody based on when their ancestors arrived in New Zealand. “We will consider supporting any political party committed to ending such preferences,” Ms Costello said. To see one of the Hobson’s Pledge adverts running in a number of NZ Community Newspapers, click here. To listen to a radio interview between Leighton Smith, Casey, and Don Brash, follow the instructions below. Once you get to the page linked to below, search down for the items circled in the illustration below. The interview is broken into segments. 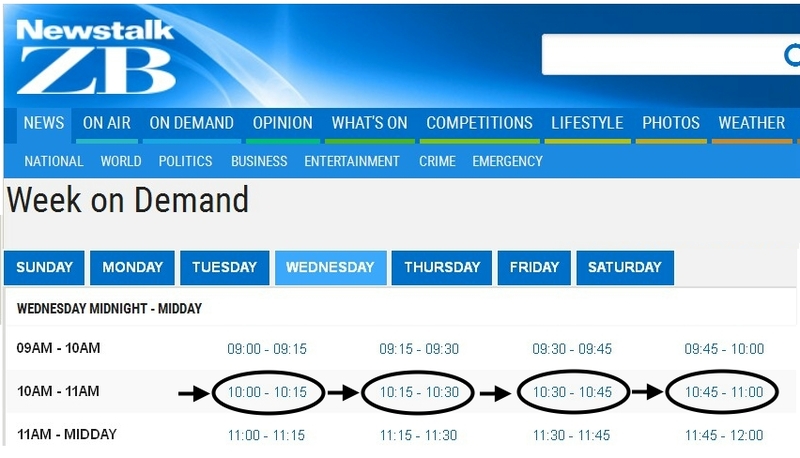 Click on 10.00 – 10.15 for the first segment, then, after it’s finished, click on the next one. Continue across the page to hear the full interview, complete with adverts!. Click here to go to the NewsTalkZB radio broadcast web page. Prepare to be attacked by all of our racist bleeding hearts and grovelling politicians. They managed to destroy the Conservative Party, now you will be the target. Stick with it as there are many thousands of Kiwis right behind you. Had to happen. So encouraging to see it. Nats opened the door to the current situation and so no surprises it has come to this. Congratulations to Don and the Team – I shall send off my $100 donation today. Keep up the good work! I wonder how long it will be before the Party of part-Maori racists start screaming racism at the Hobson’s Pledge people? So is 1Law4All going to merge with Hobson’s Pledge? Why do we have to have another separate campaign making the same arguments, complicating everything? Did Don Brash and Casey Costello talk 1Law4All to discuss tactics before launching Hobson’s Pledge? I admire Don Brash, but unfortunately he never comes over strongly in interviews with his short answers to questions. There is always such a vociferous PC backlash to anyone condemning our racist laws, such as Willie Jackson on National Radio’s Morning Report this morning. Still the Hobson’s Choice web site looks very good and slick, so that’s a good start. From what was said in the radio interview, they didn’t want to go down the form-a-political-party track. Their comments seem to indicate that was in the too-hard basket. Seems they just want to be a fund raiser for whatever politician party promises to remove racist laws and references from NZ legislation. When it comes to that, Winnie has a long history of talking-the-talk, but unfortunately, absolutely no history of walking-the-anti-racist-talk. If 1Law4All gets of its backside and gets a profile of some sort in time for the 2017 general elections, at least they have one law for all as their founding and core policy. Does 1Law4All have a leader? Last I heard, it didn’t. Maybe no one’s brave enough or has the stamina necessary for the job? The part-Maori racist mafioso would be all over whoever it was. 1Law4All does need to get it’s act together and get itself onto the ballot papers in 2017, at least. Then, if enough voters picked them as a party vote, maybe Whinlayson, Shonkey and the other racist rabble in the drone house would get the message? Maybe not, too – they seem as oblivious to democracy as the racist party of part-Maoris. And where the hell’s Ansell, these days? Noel Hilliam, is right they were about the fifth to arrive here, in 1521 30 Spanish ships stopped off at Hao Atoll where one of the ships picked up about 100 islanders the name of the ship that brought these islanders to New zealand was called TAI-NUI those people named themselves after that ship. There is a lot of false information about our true history that the people of New Zealand have had pushed down their throats. The fact that Geoffrey Palmer (Sir)and other litigious legal advisors, at the direction of tribal lobbyists, have corrupted NZ’s history is in retrospect an act of treachery promulgated against all NZ citizens. These people, who did it for personal financial gain and greed, should be brought to justice for treason. A ‘grave miscarriage of justice’ occurred when Robin Cooke at law enacted Freeman’s royal style text as the ‘Treaty of Waitangi’. All NZ’s should be encouraged to ‘think and see te Tiriti o Waitangi’ as our founding document. Te Tiriti o Waitangi can be proven to be the most ‘inclusive, simple and understandable’ treaty ever written. That document, in my opinion should be enshrined ‘at law’.